While there are plenty of gold and platinum Rolex watches available, it’s the stainless steel versions that are the most popular. In addition to being (obviously) more affordable than their precious metal counterparts, they’re also more typically understated, rugged, and sporty. As a result, waitlists for stainless steel models can, in fact, be much longer than gold versions. In our first part of our two-part series, we take a look at our top stainless steel Rolex watches from the sports watch category. Behold the Rolex stainless steel heavy hitters. The Daytona 116500 is in very high demand. 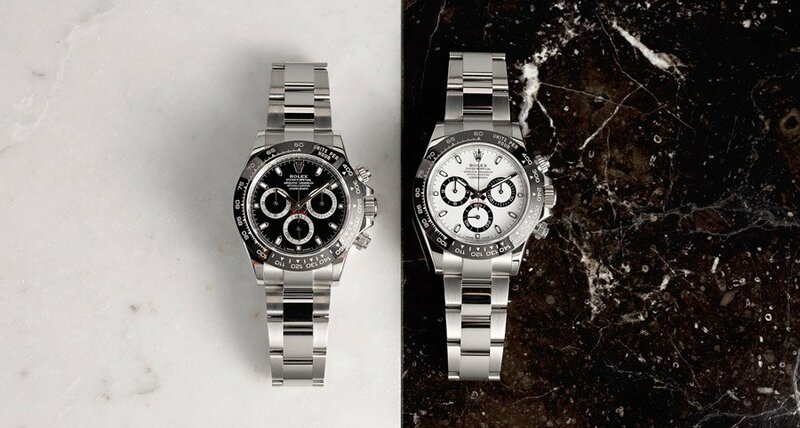 From the minute the stainless steel Rolex Daytona ref. 116500LN was unveiled at Baselworld 2016, it became an instant must-have with hordes of Rolex enthusiasts around the world vying to get one. For fans of the signature Rolex chronograph, the Daytona ref. 116500LN has everything one could want—stainless steel 40mm case with the duo of screw-down chrono pushers, a black Cerachrom ceramic bezel with tachymeter engraving, the ubiquitous steel Oyster bracelet, and the choice between a white or black dial with the trio of registers. Almost two years later, the waitlists for Daytona Ceramic ref. 116500LN are still years-long and we’re sure it’ll remain as one of our top stainless steel Rolex watches for many more years to come. The Batman is another watch that made it to the list. 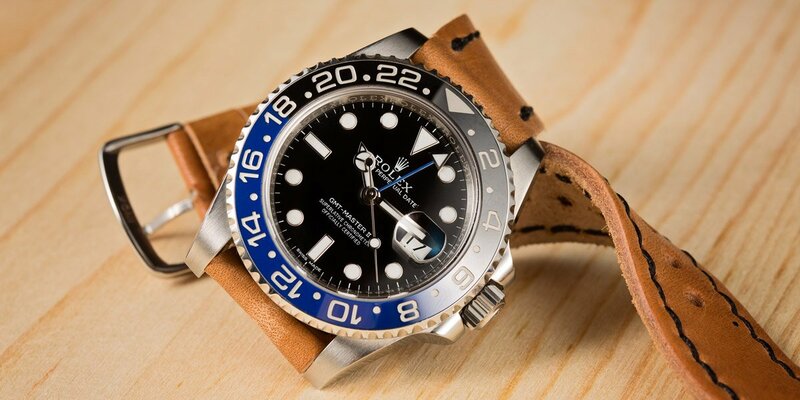 Aptly nicknamed the Batman thanks to its dark black and blue colorway, the GMT-Master II ref. 116710BLNR has also been one of the top stainless steel Rolex watches since its debut in 2013. Its introduction actually surprised many since Rolex themselves had previously said that they would be unable to create a dual-colored ceramic bezel. But they did and the GMT-Master II Batman is—almost five years later—still a tough model to find due to its popularity. 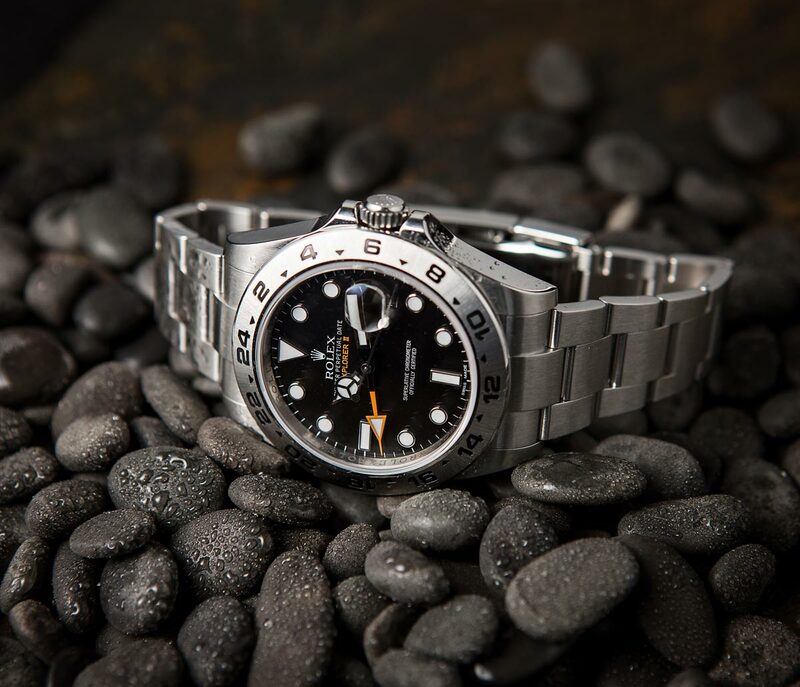 The Rolex GMT-Master II is one of the brand’s most practical models with its ability to indicate the time in three separate time zones, along with the date. The black and blue Batman bezel on the 40mm stainless steel Oyster case is especially attractive and joins the other iconic bi-color bezels—the Pepsi, Coke, and Root Beer. Plus the blue 24-hour hand with the arrow tip matches up nicely with the blue on the bezel. The classic Submariner is another watch that found its way to the top. Although most Submariner models come with the date function, we love the symmetry and simplicity of the no-date version. 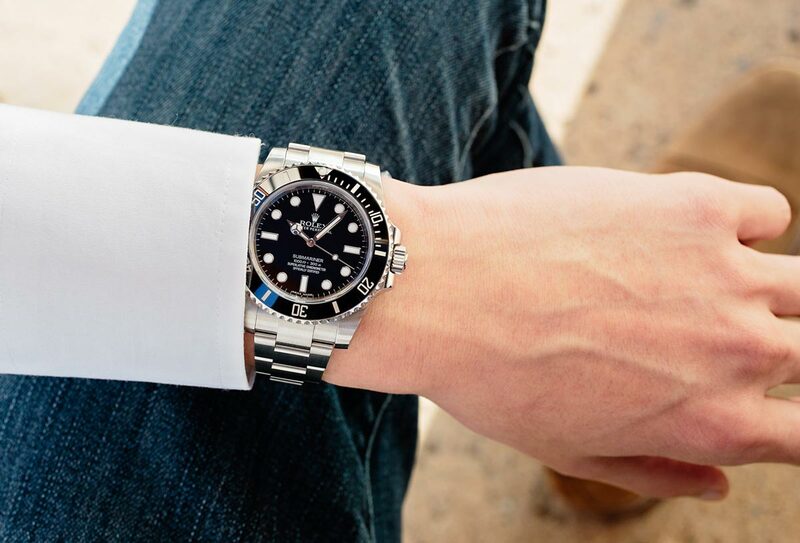 The most current edition of the no-date Sub is the stainless steel Submariner ref. 114060, complete with a Cerachrom ceramic diver’s bezel. Also, as a diver’s watch, the Submariner ref. 114060 boasts other diver-friendly features such as the Oyster bracelet with the Glidelock extension system and water resistance to 1,000 feet. The lack of a date window means that the sapphire crystal protecting the dial does not include the Cyclops magnifying lens, thus is completely smooth and uninterrupted. As far as tool watches go, the 40mm Submariner ref. 114060 is one of the top stainless steel Rolex watches to own. This Explorer may not be made of gold, but it is still a keeper. The Explorer II ref. 216570 is a beautiful example of how Rolex creates modern sports watches while still paying tribute to vintage references. The current Explorer II ref. 216570 uses design elements from the inaugural Explorer II watch, such as the orange arrow-tipped 24-hour hand, engraved metal bezel, and highly luminescent dial. However, these features are repackaged in a contemporary sports watch that includes a generous 42mm Oyster case, an Oyster bracelet equipped with the Easylink extension system, and the very dependable in-house Cal. 3187 automatic movement. Though the Explorer II ref. 216570 is offered with the choice of a black or white dial, the white dial version—affectionately known as the Polar—is one of our top stainless steel Rolex watches right now. The bright white dial sets the perfect stage for the lume plots with black surrounds and bright orange details. The new iteration of the Air-King. The launch of the Rolex Air-King ref. 116900 in 2016 was a controversial one. 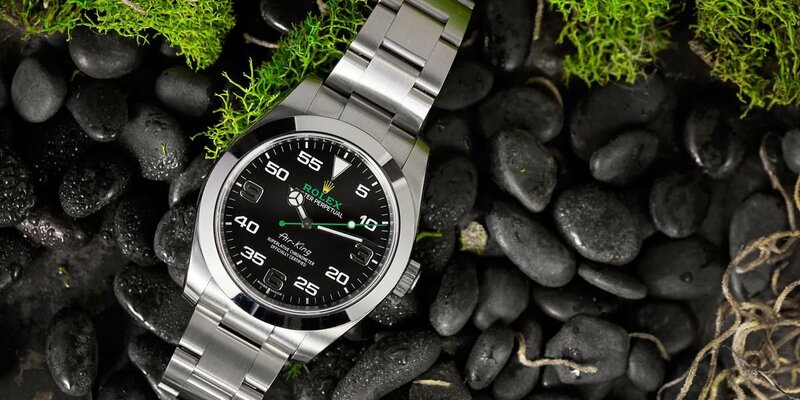 Unlike other Rolex sports watches where the brand takes care to retain the original style while updating key features, the new Air-King is nothing like preceding models that carry the same name. Not only does the new Rolex Air-King ref. 116900 sport a much larger 40mm Oyster case, it features a complete dial redesign too. A far cry from the minimal aesthetic of former Air-King models, the new Air-King includes a mix of Explorer-style 3/6/9 numerals alongside 5-minute markers. There’s also the green lollipop seconds hands along with the matching green ROLEX name, topped with a bright yellow coronet. Despite the controversy, we are squarely in the for-the-new-Air-King camp and regard it as one of the top stainless steel Rolex watches currently available. Don’t miss our second part of this series where we’ll delve into our top stainless steel Rolex watches from the dress watch category.